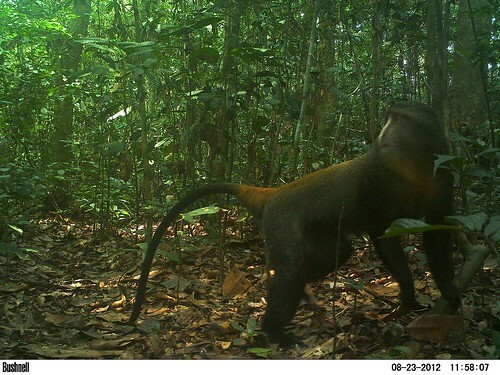 The terrestrial Lesula, new species of monkey from TL2, strikes a pose for a hidden camera. 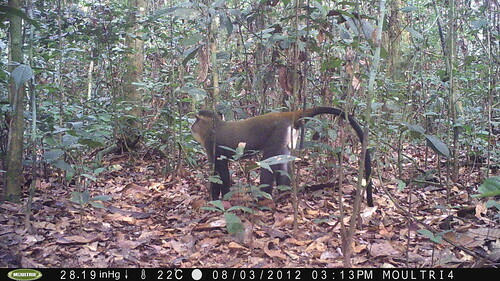 At the close of 2012 we had 8 camera traps in the forest. The photos from the last few months of the year are reassuring. There were some surprises — and inspiration for the New Year. Despite its size, nearly as large as a bushpig, aarvarks are among the least frequently seen of TL2 large mammals. This one shows the shorter ears that are a characteristic of the form in the central basin. Aardvarks and giant pangolin are nocturnal and rarely encountered. 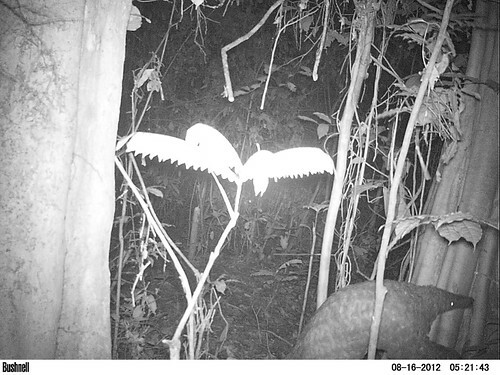 The giant pangolin lumbers through the forest at night. The giant pangolin and the aardvark feed on termites and ants. Usually their presence is only known by their diggings into ground-dwelling termite colonies. The black guinea fowl was not expected in the central basin. In the far south of TL2 we first discovered this fowl killed by hunters. 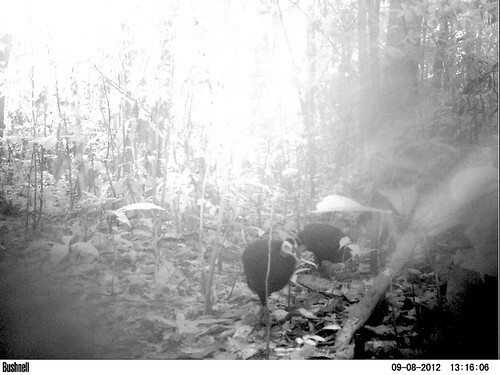 These three birds captured by camera trap extend the black guinea fowl’s range 100 km into the forests of Congo’s central basin. We have used cameras to do two different kinds of surveys: first we surveyed “edos”. These discrete sites are small clearings in the forest that are used by different animals often apparently seeking nutrients that seep from the ground. 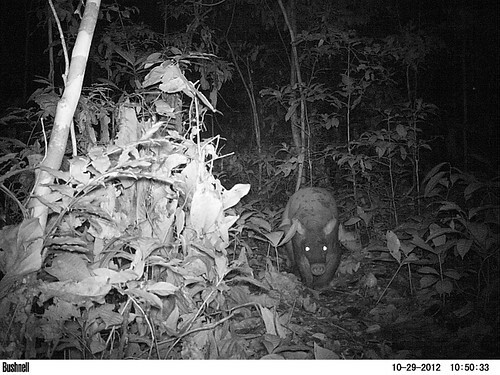 In our last series of photos we had elephants, forest buffalo, and bongo at edos. 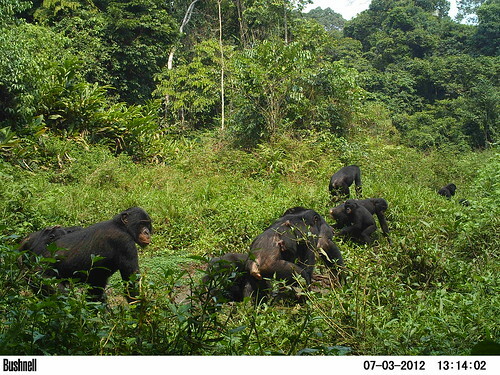 More recently a photo caught 12 bonobo ambling through an “edo” clearing. We also use the camera traps to survey our Losekola study area where we have laid out a path grid. 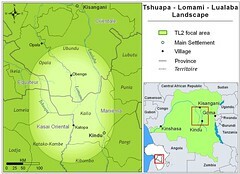 The Losekola study area is to the west south west of small village, Obenge, by about 6km. The white points show where camera traps were deployed. These paths allow regular observations and facilitate studies. 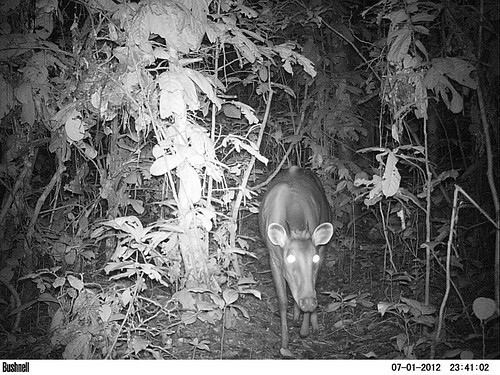 This is a male yellow back duiker, largest of the forest duiker-antelopes. This leopard was photographed at three different sites. There is something uncanny in the seeming intelligent light of this bushpig’s eye. 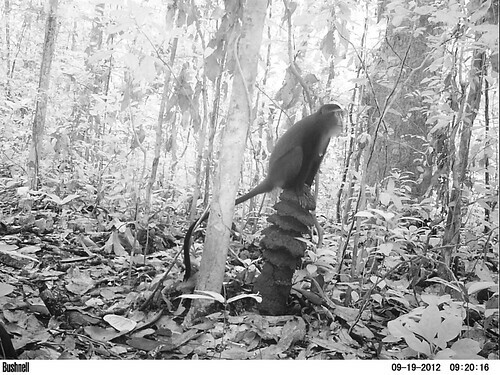 A small pagoda termite mound seems to attract both bonobos and TL2’s new species of monkey – the lesula. Bonobo walks up to the termitarium. A baby sits astride its mother behind some leaves. A young lesula perches on the termite mound. An adult lesula takes over the termite lookout. 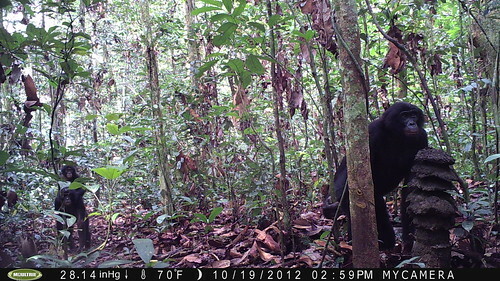 What the camera traps tell us of the abundance of bonobos and Lesulas is particularly encouraging. We have recorded lesulas at every one of the camera settings on the Losekola study area with up to 5 individuals photographed in a single event. At least one adult male can be recognized individually by its strong facial markings. 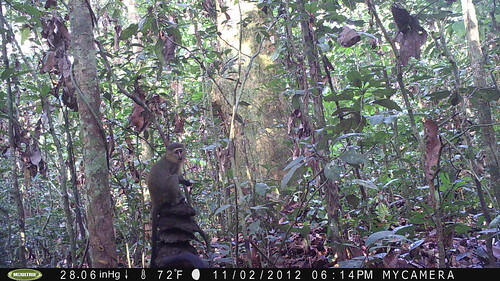 We will continue to expand the camera trap studies in 2013. 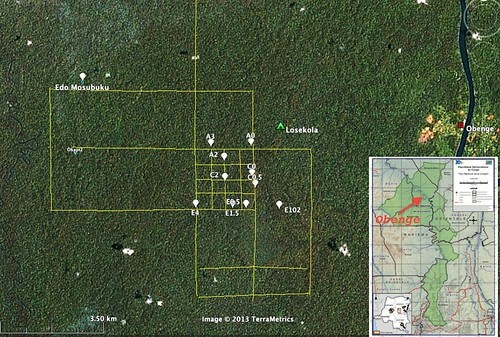 Our next steps include initiating surveys of other “edo” clearings in the Tutu basin. 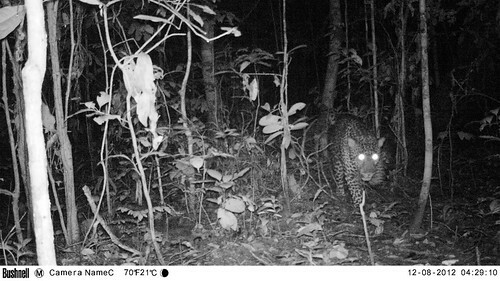 The camera traps will be a major focus for us in 2013 with the arrival of two collaborative projects now in development, one to survey forest cats, including we hope the elusive and apparently uncommon golden cat, and a second to develop estimates of distribution and abundance of lesula in the Losekola area. 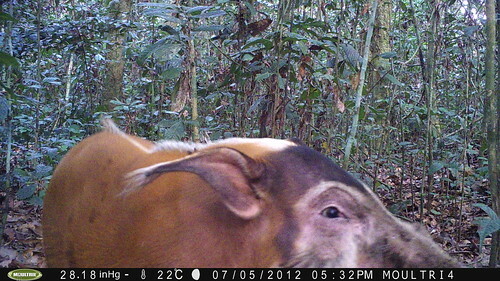 The camera trap study is led by John Hart who works with Pablo Ayali and Maurice Emetshu. This entry was written by Terese Hart, posted on 2013-01-11 at 4:14 am, filed under About the project, Bonobo, Mystery monkeys, The Forest. Bookmark the permalink. Follow any comments here with the RSS feed for this post. Post a comment or leave a trackback: Trackback URL. Great shots of these beautiful fellow animals. Thanks for sharing. I’m really impressed by your work. These photos are uncanny. I work in Mali, so I know about hard times. Thanks for all that you’re doing for conservation. A word of encouragement from someone in Mali is strong encouragement indeed!! We are following the country day by day as much of the world is. Courage! Great story. I never knew about this form of the aarvark. And how changes the forest if all this animals become rare or dy out? Thank you for the work that you do. I had never heard of the lesula monkey until now. I know that you encourage outside experts to join in on your research efforts, but would it be possible for a layman to observe you and your team in action? I would not want to be a burden but I am very interested in visiting the site(s) where you have conducted your research on a short-term visit. Would this be possible? Could you email me about my inquiry? Many thanks! Wow, I learn a lot when I read your posts.You guys just keep on doing what you love and it amazes me. Those summers years ago when you were in Mpls.,one when the bunk beds came to you in an apartment on 28th(??) and one when you stayed in my house on Goodrich…What were you doing in Mpls at that time. ?I can ‘ t remember.